I have so many children’s picture books about animals to share with you this week that I am breaking them up into two posts, one for today and the next for Friday, 21 October, 2016. 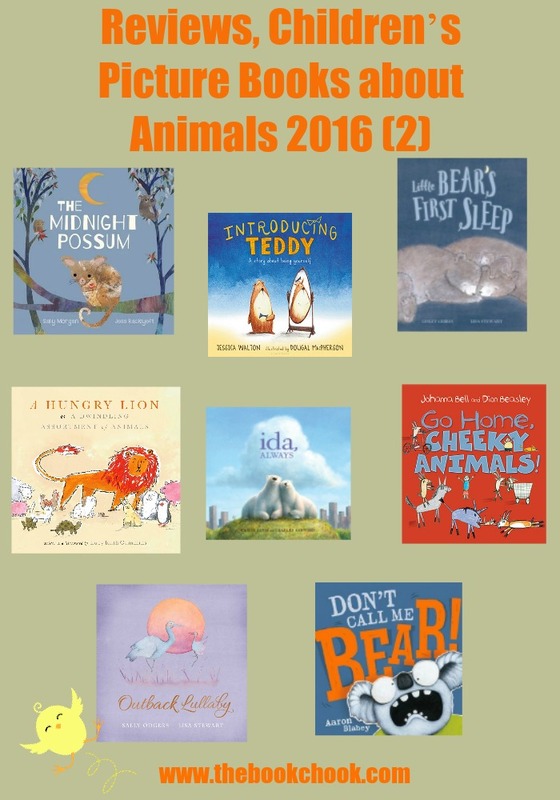 My first post about animal-themed picture books in 2016 was earlier this year. The concept is simple, but it’s a winner. Canteen Creek has a problem with animals and despite everyone’s best efforts (except for the dogs! ), more and more cheeky animals arrive, causing mayhem. Bell’s narrative brings the scenes to life, and she cleverly provides lots of places for young listeners to join in with a shout at the animals. But it’s Beasley’s illustrations I adored. These are so perfectly aimed at kids: imitating a child-like style to perfection, adding to the humour and chaos. This is an excellent text to share with kids who want to learn about Australia’s remote places and communities, as well as making a great read-aloud for anytime. Ida, Always is by Caron Levis and Charles Santoso, published by Koala Books, an imprint of Scholastic, 2016. RRP: $24.99. An exquisitely told story of two best friends—inspired by a real bear friendship—and a gentle, moving reminder that loved ones lost will stay in our hearts, always. Books with a friendship theme are always popular, and make great resources for Mental Health Week (October 9-15, 2016) or Friendship Day (August 6, 2017). But Ida, Always is so much more. You see, Ida the polar bear is dying, and her best friend, Gus, must come to terms with that. Levis and Santoso gift us with a book that is a moving, uplifting , yet pragmatic look at death and the lasting legacy of a loved one in our lives. Beautiful written and illustrated, I have no hesitation in recommending Ida, Always to libraries everywhere. Outback Lullaby is by Sally Odgers and Lisa Stewart, published by Scholastic, 2016. I loved the earlier Lullaby books. This is just as good, a perfect way to introduce kids to poetry about Australia and outback creatures, by the incomparable Sally Odgers. Lisa Stewart’s illustrations are gentle and muted - kids will love them. A Hungry Lion, or A Dwindling Assortment of Animals by Lucy Ruth Cummins, was published by Simon and Schuster, 2016. I loved the slightly dark overtones to A Hungry Lion, and kids will love the repetition, and the twists and turns. It’s a fun children’s picture book that’s great for getting kids to predict what might happen next, and to interpret from the combination of slightly enigmatic words and bright crayon illustrations. Little Bear is in the cave with his mother and father, who have settled down for their big winter sleep. But Little Bear has a problem—he can’t get to sleep! He snuggles and sings and softly strokes his ear. Will Little Bear be able to get to sleep before springtime? I think each of us can relate to those times when we know we are supposed to sleep, but can’t. Little Bear makes valiant attempts, so kids will chuckle over his antics, and enjoy trying his unusual methods while they listen. Stewart’s illustrations add a gentle softness and make this a perfect read-aloud for bedtime, or any time at all. Introducing Teddy by Jessica Walton and Dougal MacPherson, was published by Allen and Unwin, 2016. RRP: $14.99. I love this theme of friendship triumphing over gender. Walton’s message isn’t heavy-handed either. While some kids will be at a stage where they want to understand gender transitioning, others will not, but may be ready to think about the less complicated issue of being able to have a friend of a different gender without worrying about “boy germs” or “girl germs”, or about people and teddy bears being able to express themselves without needing to adhere to a strict stereotype. MacPherson’s delightful illustrations add depth and joy to the book. Don’t Call Me Bear by Aaron Blabey was published by Scholastic Press, 2016. RRP: $16.99. G’day my name is Warren, and I’ve got something to share... Just because I’m furry doesn’t mean that I’m a bear. Warren the Koala is many things—a marsupial, cute and furry, a bit of a grump—but the one thing he’s not is a bear! Kids will grab this book off the shelves with an anticipatory chuckle, and they won’t be disappointed. Blabey’s Koala has an attitude and it’s not surprising, considering all that incorrect labelling. The rhyme and rhythm and even the grumpy koala shouts make Don’t Call Me a Bear a must-have for read aloud and works as a light-hearted introduction to marsupials. The Midnight Possum by Sally Morgan and Jess Racklyeft, published by Omnibus Australia 2016. RRP: $ 24.99. Possum seems fairly normal - around midnight, once the moon rises, off he goes through the bush, looking for red gum flowers to nibble. But one night he is asked to rescue a baby possum, and reveals himself to be the hero he really is. The simple tale allows kids to explore the Australian bush environment and meet other bush animals. Rackyleft’s illustrations hint at texture through gorgeous collaged art work, blending colours and patterns to great effect. Delightful! Find more children’s picture books and articles about animals by browsing here: Reviews: Recent Picture Books about Animals 2015, Reviews: Recent Picture Books about Animals 2015 (2), Reviews: Recent Picture Books about Animals 2015 (3), Reviews: Recent Picture Books about Animals 2015 (4). Find some of my articles about using animal resources with kids here.